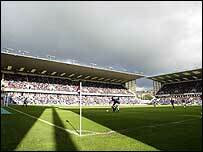 The FA has confirmed an England B side will face Albania at Burnley's Turf Moor ground on Friday, 25 May. Boss Steve McClaren sees it as a vital game in his build-up to the vital Euro 2008 qualifier in Estonia on 6 June. England's last B game was against Belarus at Reading 12 months ago and McClaren views the concept as a key way to give his fringe players experience. It will be the last time England will play in the north-west before facing Brazil at the new Wembley on 1 June. England's games were mostly played at Old Trafford while the new national stadium was being constructed.